Victoria's largest National Park is a place to experience the great Australian outdoors in all its magnificent guises...Dinner Plain village is completely surrounded by the Alpine National Park. The Alpine National Park covers 646,000 hectares and is the State’s largest, Mount Feathertop, the Razorback, Mount Bogong and the rolling high plains being the best known features. The park offers excellent camping and hiking, as well as a range of other activities and highlights. Extensive snowfields are the primary winter attraction with mountain peaks covered in snow. The warmer months of Spring, Summer and Autumn unveil stunning wildflower displays and provides the opportunity for bushwalking, trail running, mountain biking, trekking, camping and four wheel driving. The Alpine environment is one of the most pristine environments in Australia. 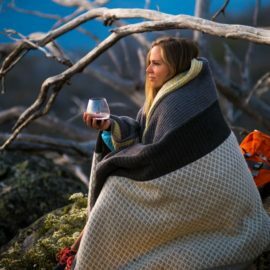 Dinner Plain and surrounding villages are the best places to stay and partake in day trips to discover the Alpine National Park, including Mount Hotham, Mount Feathertop and Mount Bogong. 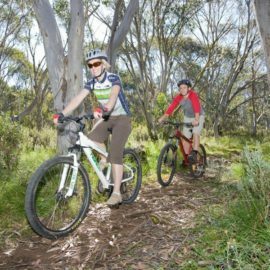 A number of Parks Victoria-approved tour operator’s guide bushwalks, horse rides, birdwatching, canoe and cycling treks year-round. Go to parks.vic.gov.au.au for more details. If you wish to immerse yourself in the park and pitch a tent there are designated camping areas equipped with toilets, picnic tables and fireplaces.